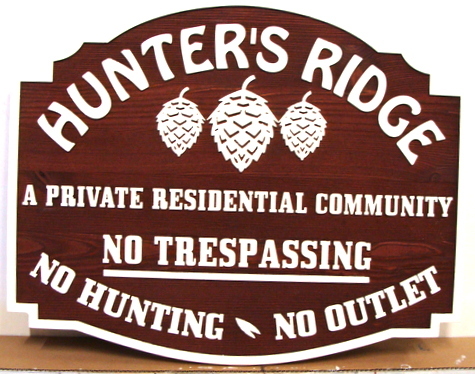 This highly-readable and rustic stained Western Red Cedar residential community entrance sign has been carved with in both 2.5-D relief. ( 2 levels). The text, border and pinecones are elevated by carving away the background, which is then stained. The text, art, and borders are painted reflective white for maximum visibility. Two layers of clear-coat are applied to protect the sign against scratches and UV fading. The sign can be mounted on a gate, wall, on a post or between two posts, or hung from a wood or iron hanger from the eye-hooks on the top.